Liver disease is complex, varied and fluctuates, meaning that no one person’s experience of liver disease is the same as another. Your experience of liver problems may vary from day to day. This is partly because the liver has a huge number of functions and so liver failure can affect almost every part of your body and the way you feel. This guide is for people living with a liver condition, and their families, to explain some of the emotional, physical and practical problems of the disease. It will help you to manage your condition by suggesting questions to ask, choices which you can make for your care and highlighting the help and services which are available. Some sections contain information for people with advanced liver disease and serious symptoms. It is important to remember that many people do not experience severe problems from their liver disease and much of this information may not apply to your condition. If you have questions about the information in this publication, please discuss this with your medical team. 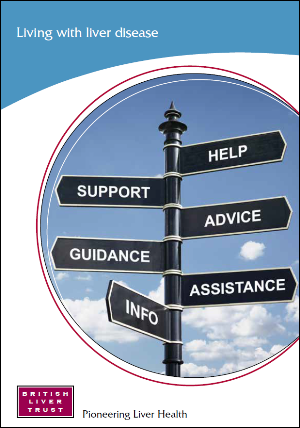 Please visit the support section of our website for information on support groups in your area. Also our Useful Links section contains information on NHS Services, Benefits and Entitlements, local Liver and Transplant units, and more. make sure you are regularly checked for complications so that they can be treated. See the full guidance by clicking here. make sure doctors explain what treatments are available to you. Reviewed by: Dr Toby Delahooke, Consultant Hepatologist, Leicester Royal Infirmary, Phil, B.B., Linda, Judith, Lynda.